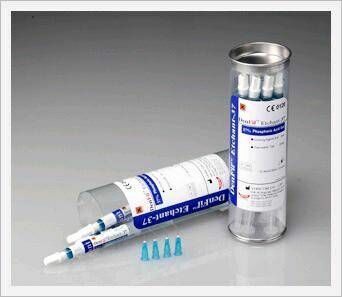 The strong point of this etchant is thickened with natural polymer materials so that it does not leave any white residues on the surface of etched tooth like silica thickened etchant - such as Vista Etchant; the white residues reduce the bonding strength. The numbers mean the concentration of phosphoric acid. A Semi-gel type designed for easy etching work where you want it. Fast effect and easy removement. Leave no residues on the surface of etched tooth like silica thickened etchants. Step 1: Apply etchant and wait for 15 seconds after applying. Step 2: Rinse with air / water spray remove all traces of etchant. Step 3: Dry and observe the chalky appearance of etched surface. Step 4: Repeat steps 1 ~ 3 if desired.